This project demonstrated that through the implementation of Landscape Management Tools it´s possible to improve the well-being and promote more sustainable livelihoods in a rural community, that faces the consequences of inadequate use of land and biodiversity. We implemented Landscape Management Tools such as isolation of natural cover relicts, enrichment of conservation areas, improvement of pastures, and reconversion activities to sustainable productive systems (silvopastoril systems). Additionally, we carried out participatory workshops about biopreparates, restoration and conservation, and organic fertilizers; we established conservation agreements with land owners, and installed a mist-catchment system to secure the water provision for the silvopastoril system. We accomplished the expansion of 3.4 ha for strict conservation of the protective forest, and capacity building in the local community to sustain the implementations in the long term. We were able to share the results of this project in a national conference on Restoration Ecology, and produced divulgation material in the form of brochures. One of the main environmental threats for Colombia (and the world) is the irrational use of natural resources, which leads to the degradation of ecosystems and the loss of biodiversity. In response to this issue, CORFOPAL was founded as an environmental NGO 18 years ago, and has since worked for the integral management of the environment, as a fundamental element for human development and survival. Our main goals include the promotion of new private and public protected areas, and the achievement of balance between nature and human needs, through sustainable productive systems that guarantee the conservation of biodiversity and the offer of ecosystem services for the maintenance and improvement of human well-being. Through the implementation of management plans, integration of scientific and traditional knowledges, and the establishment of a participatory process that engages the local communities and builds capacity, we aim to empower the community and secure the future sustainability of our projects. One of the most threatened ecosystems in the world is the Tropical Dry Forest (TDF) (WWF 2013), which in Colombia is in a critical fragmentation and detriment status, due to landscape transformation and changes in the use of land that have taken place in the last decades. This ecosystem used to cover over 9 million ha, of which now remain about 8%; this means that more than 90% of the TDF in our country has been cut. Out of this remaining 8%, less than 4% belongs to natural TDF; and 5% corresponds to remainders with some degree of intervention (Pizano y García 2014). In Cauca Valley department, Colombia, the TDF ecosystem has an area of 7627.5 ha, out of which 804.1 ha are in an original state (without intervention) (CVC-FUNAGUA 2009). In this regard, the fragmentation and transformation processes are more evident in mountainous tropical regions where there is a great diversity of habitats in relatively small areas, and especially in rural landscapes that have been modified by human activity into a mosaic of productive systems and isolated fragments of natural habitats. In response to these issues since 2015 we have been working in the project “Conservation and Restoration actions in the Dry Forest Ecosystem of the Santa Rosa watershed as an intervention strategy in favor of biodiversity, ecosystem services and sustainable production”. These actions were previously agreed upon with the properties’ owners, and were designed taking into account the available information about the history of disturbances and the original ecosystems. This intending to initiate, reinitiate, or accelerate the processes that give place to the restoration of a healthy ecosystem, characteristic of the area. The former enables the integration of conservation and restoration efforts and the traditional productive activities of the area, as well as facilitate the adoption of new technologies and tools through a participatory approach that benefits from the knowledge of local producer and combines ethnologic, agricultural and ecological methodologies (Altieri 2004). 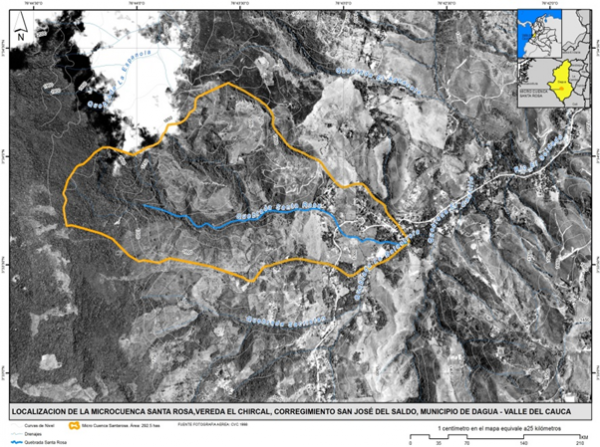 The study area of the project was the Santa Rosa watershed (SRW) basin and the TDF associated to it (Figure 1). The SRW has an approximate area of 292.5 ha and 2.6 km length, of which only 35% has forest cover; the remaining 65% corresponds to pastures and shrublands. The main problem in this area is the loss of natural cover of the natural forest and the ecosystem services it provides, due to the expansion of the agricultural frontier, the promotion of clean crops, and cattle-raising. An important part of the SRW goes through two Natural Reserves of the Civil Society (NRCS): Carare I and Carare II, which are private protected areas that conserves the TDF located within its limits, and a neighboring property where there used to be pastures for cattle (called Canaan). In these properties is where the project was carried out. The areas are located in the surroundings of San José del Salado village, which, along with the Dagua city people, is the main community affected by the loss of biodiversity and ecosystem services in the territory and the main beneficiaries by the outcomes of this project. The community that’s near the project area is the San José del Salado village, and the land owners of properties neighboring the reserves and Canaan. This village is in the rural area of the Dagua municipality, where the main human populations in the area is present. Dagua is located at 828 m, has a mean temperature of 25 °C and it’s characterized by abundant summits, where three ecosystems (the TDF, tropical wet forest and subxerophytic forest) merge and give place to the many basins and micro-basins of the region. The Dagua municipality has 923 km2 of surface and more than 36000 inhabitants. According to the Territorial Order Basic Plan and the Municipal Educational Plan of 2008-2011, about 35.3% of the population is in a poverty situation, and the unemployment rate is 20%. The San José del Salado village is the closest settlement to the project area, it has 19502 ha and approximately 400 inhabitants. The main threats for the village were i) the loss of soil resources and in turn of their productive capacity, ii) biodiversity loss, iii) loss of environmental services generated by ecosystems and its associated biodiversity (i.e. seed dispersion, pollination, plague control), and iv) the reduction of the amount and quality of water available for the community. The main productive activities in the region are agriculture, cattle raising, poultry farming, pisciculture, mining, and tourism. These activities are benefited by the diversity of climates that are present in the wider region. In the case of Dagua, the main economic activity is agriculture, specially the pineapple crops that present a high production and quality. Other crops are tomato, cacao, banana, coffee, papaya and citrus fruit. The main objective of the project was to implement conservation, restoration and sustainable production actions in the Dry Forest ecosystem of the San José del Salado Village, as determined in the Management Plans for the NRCS and surrounding properties in the SRW, that lead to the improvement of the environmental and ecosystem services offer and quality in the territory. To accomplish this, several actions were taken that benefited the conservation, restoration and sustainable use of the TDF in an approximate total area of 86 ha, in three properties located in the SRW (two of which are NRCS). We worked looking for four fundamental outcomes: 1) the isolation of remaining TDF patches (1.1 km), 2) the extension of the protective forest fringe (1 ha), 3) the reconversion of ranchers’ productive systems (1 ha), and 4) the community empowerment (4 workshops and 1 brochure). This project demonstrated that through the implementation of Landscape Management Tools it´s possible to improve the well-being and promote more sustainable livelihoods in a rural community, that faces the consequences of inadequate use of land and biodiversity. The activities that we carried out can be summarized in Table 1, that includes the measure units, the intended outcome and the reached outcome. We implemented the planned activities in four stages. The first one consisted in the consolidation of the diagnostic and base line information available for the three properties, focusing in the areas surrounding the SRW. We identified the climatic, geographic and hydrologic characteristics of the watershed, as well as the biological and ecological components. We also described the social component, taking into account the traditional economic activities, the productive systems present in the three plots, the infrastructure, and the services (water, gas, electricity) available in the plots, and in San José del Salado. During stage two, we socialized the project with the community of San José del Salado and owners of neighboring properties, a space where we managed to strengthen the community process by laying out and analyzing the proposed objectives and activities for the project. The participants were then invited to assist to the training workshops that would follow, and we introduced briefly the topics that those workshops would approach. It was also during the second phase that we defined the Landscape Management Tools (LMT) that we would use in the next stages. We considered the characteristics of the plots we would intervene, such as productive activities present, and the type of natural cover we found. We carried out activities related to the plot’s restoration, such as the identification of the observed alternative states, which were analyzed to find a pattern of natural succession, from less developed composition and structure states to a state of greater structural complexity, identified as the target status for the zones with greater interventions (most degraded). Additionally, we made de design, protocol, and establishment of the temporary nursery for the plants (Figure 2), as well as the design of the silvopastoril reconversion system, and a watering system for the pastures and the cattle. We defined the isolation of the remainders of natural cover, and planted native species for enriching the most affected areas by the farming activities. 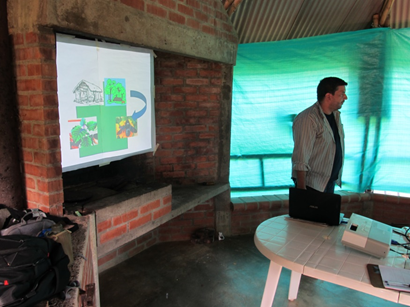 In this phase also took place the theoretical-practical workshops about conservation, ecologic restoration of riparian forests with native flora (Figure 3), and about biopreparates and organic fertilizers. The third stage was when we implemented the designed LMT, the reconversion of cattle raising productive systems to silvopastoril systems, we installed fences to isolate the patches of natural cover (Figure 4), and we established the watering system. These implementations were made in previously defined areas, with the help of the land owners and through an exercise of social cartography. The activities for recuperating each type of cover were defined, which consisted in the nucleation and planting in the borders and the inside. Also, we performed the theoretical-practical workshop called “Protein banks and multinutritional blocks”, and we defined the conservation agreements with private land owners. As a complementary strategy for the watering system, we designed a mist catcher (Figure 5) for capturing the water vapor in the environment and that way provide the necessary water for the plots in the highest part. The ecological restoration began in this stage, enriching the defined areas through plantings that involved the community members. The fourth and last part of the project consisted in the consolidation of the results, compiling all the performed activities and the implementations made. In summary, the project resulted in the isolation of natural cover remainders, the extension of protective areas of the dry forest through the enrichment of those zones with native species, the implementation of reconversion actions into sustainable productive systems (silvopastoril system), and the training in ecological restoration and sustainable production practices of community members associated to the SRW and the TDF of the San José del Salado Village. Taking into account that the Satoyama Initiative envisions societies in harmony with nature that include human communities that develop and maintain socio-economic activities in line with natural processes, our project is an example of a co-management system and of the consolidation on conserving diverse ecosystem services and values, because allows the involvement of the community and the owners of the reserve in the conservation and restoration process of the TDF, but also in the implementation of sustainable productive systems, contributing to sustainable socio-economies and improved community resilience. Also, trough the empowerment of the community we were able to improve the relationship with community members, and to integrate local traditions into the design of the conservation and restoration tools. With this project we achieved the expansion of 3.4 ha for strict conservation of the protective forest of the SRW, adding up to a total of 66.9 ha in conservation. 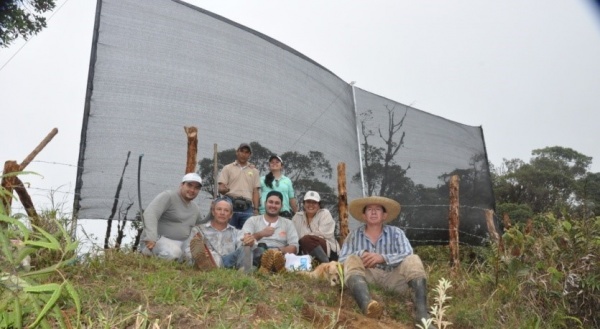 We installed about 492 m of mixed fences which are a significant input to the connectivity of the landscape, besides being a support system for the silvopastoril areas. The species that were planted will strengthen the biological corridors between existing patches of the three properties. The success of the project was greatly determined by the representative community participation in the proposed activities, the exchange of knowledges we accomplished between local people and experts, and the accompaniment of government institutions such as the Mayoralty. We learned that it is essential that the people who intervene in a territory have clarity about the range that the policies, concepts and projects can have. This in order to avoid making mistakes in the planning and the implementation of actions in the territory, and to be able to define the right priorities and focus resources on the relevant activities. Also, it is necessary to involve younger generations in the process, such as students and new inhabitants (that are commonly disengaged because they aren’t familiar with the territory). If it was possible to involve young adults and children, the empowerment of the community over the territory would be enhanced, and could become permanent. There is still a need to get a deeper understanding of the culture and traditions of the territory, in order to determine better strategies to build a participatory management of the environment and ecosystem services. We identified a loss of interest in the country life from the new generations, who also ignore the importance of ecosystem’s conservation, planting techniques, the use of medicinal plants, and the farming labor. It’s essential to have a property planning that incorporates sustainable production and ecosystem conservation. We need to strengthen the communities’ capacities in order to guarantee the future sustainability of the projects. It’s fundamental to recover traditional knowledges about the productive systems and nature care, that promotes biodiversity conservation in productive landscapes. Corporación Autónoma Regional Del Valle Del Cauca (CVC) y Fundación Agua Viva (FUNAGUA). 2010. “Aunar esfuerzos técnicos y económicos para realizar el análisis preliminar de la representatividad ecosistémica, a través de la recopilación, clasificación y ajuste de información primaria y secundaria con rectificaciones de campo del mapa de ecosistemas de Colombia, para la jurisdicción del Valle del Cauca”. 243 pp. PIZANO, C. & GARCÍA, H., 2014.– El Bosque Seco Tropical en Colombia: 349 pp. Instituto de Investigación de Recursos Biológicos Alexander von Humboldt (IAvH), Bogotá D.C.
Orjuela-Salazar, Sebastian et al. In press. ACCIONES DE CONSERVACIÓN Y RESTAURACIÓN PARTICIPATIVA EN EL BOSQUE SECO TROPICAL DE LA MICROCUENCA SANTA ROSA – DAGUA‚ VALLE DEL CAUCA. Revista Biota. Sebastián Orjuela: Biologist with expertise in biological characterizations, Ecology, Mammalogy, Environmental Education and Skills development, formulation and implementation of research projects. More than 5 years working in planning and declaration of protected areas in the Valle del Cauca in the framework of the Departmental System of Protected Areas. Andrés Quintero Angel: Biologist with experience in the study of Reptiles, medium and large mammals, and conservation work with ethnic communities. Current research includes the effects of fragmentation and landscape transformation on Wildlife in the Neotropics. Sara Rodríguez: Biologist with studies from the Pontificia Universidad Javeriana of Cali, with emphasis on conservation biology. Has been working with CORFOPAL since 2016, in the project presented in this case study.